Fidel Castro, who survived more than four decades of assassination attempts by the United States and outlasted 11 American Presidents, passed away on November 25. Flag-waving Cuban students are chanting "I am Fidel" to salute the fearless leader who refused to compromise on his principles. Dictator or not, he remained committed to his vision of a just and equitable world order even when the world had moved on. What were the growing years of Castro like? Fidel Castro was an illegitimate child (which was later given legality through marriage) and it is possible that the rage he felt had to do something with this fact. Fidel’s father, Ángel Castro y Argiz, was a migrant to Cuba from Galicia, Northwest Spain. He had become financially successful by growing sugar and selling it to American buyers. It was difficult to imagine then that Fidel would one day become the leader of the movement against American capitalism. Aggression was in his genes too. His mother, Lina Ruz González, who worked as his father’s maid before marriage, would fire a gun in the air to call the family - which included Fidel and his six siblings - for dinner. She must have been an adamant woman for she did whatever it took to ensure her children got the best education Cuba could offer. Fidel was notorious for his aggression, so much so that he was expelled, along with his two brothers who were no less violent, from the La Salle boarding school in Santiago. Fidel, upon being told that he will now have to study locally, warned his mother that he will burn the house down if he was not sent back to Santiago. He was promptly sent back to Santiago, this time to the privately funded, Jesuit-run Dolores School. His family knew he could actually raze the house down to get what he wanted. 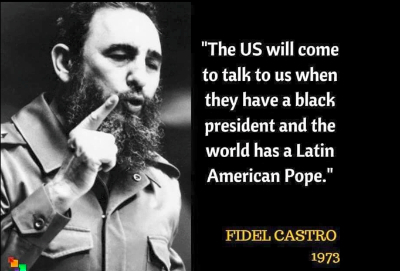 The United States of America would discover this trait of Castro much later. Young Fidel impressed his teachers with his athletic abilities, his photographic memory, and his tenacity. His classmates called him ‘the crazy one’ because Fidel would do whatever it took to not lose. They knew even then that Fidel will fill the book of his life with many glorious chapters. As it turned out, the book itself was glorious, every word of it. In an outing with his college friends, everyone was discussing what they wanted to be. ‘Make a lot of friends’, ‘Lawyer’, ‘Doctor’, ‘Rich’ were the responses from Fidel’s friends. Fidel only revealed what he wanted when a friend made it mandatory for him to answer. ‘Glory’, that is what Fidel Castro wanted. Fidel’s generation had a terrible sense of frustration. In 1930s, if you were young and active in Cuba, you had to carry a gun - not to kill, but to protect yourself and your friends. The generation was witness to how a country with great economic potential was becoming a political disaster. The leaders were either corrupt or they were killed or they were replaced by the United States. While he was a student at the University of Havana, Fidel came under the influence of nationalist professors. He started studying Cuban history carefully and realized that the US was the reason Cuba was not in control of its destiny. Fidel jumped into the fray. He organized strikes and demonstrations, ran (unsuccessfully) for university union President, and even joined an armed gang. One of his friends would later recall that Fidel was both - a genius and a gangster - at the same time. He was arrested then released for the murder of a rival student leader; one witness testified against Fidel for assassination of a university sergeant but later withdrew his testimony. Fidel was introduced to his future wife - Mirta Díaz Balart, whose family was among the Cuban elite - by a friend as a ‘psychopath, crazy and paranoid’ who might as well throw her off the tenth floor if he was not happy. She said she knew it already and she was in love. The friend surrendered, ‘Alright, luckily you have to marry him, not I’. They were married on October 12, 1948. The honeymoon, by the way, was in New York. Díaz Balart's father had given them tens of thousands of dollars to spend on this three-month vacation. Back to Havana, he settled as a lawyer. Though he was born in a rich family, Fidel never cared for money, and gradually, money too stopped caring for him. 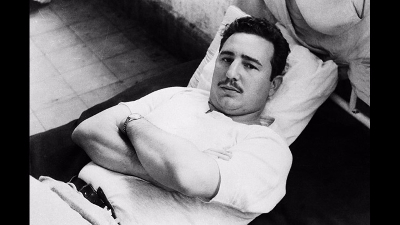 He once came back to discover that all his furniture, including his son’s bed, had been taken away as mortgage because Fidel had not paid the bills for long. Politics was all Fidel cared about. He did not have empathy for the ordinary things in life. Why was it possible for Fidel Castro to raise a revolution? Fidel’s life was in turmoil - no money, marriage in trouble, and perhaps most distressingly for him, no hint that he would live a life less ordinary. All revolutionaries need optimum conditions for their rise. 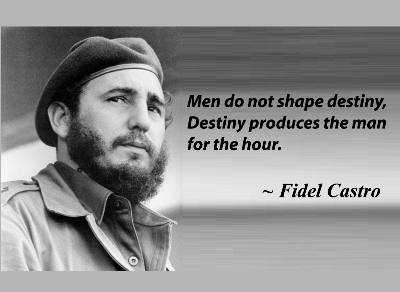 Fidel Castro’s tryst with destiny was about to happen. By 1948, Castro had turned from an anti-imperialist and anti-corruption campaigner to a distinctly left leaning activist condemning social and economic inequality in Cuba. Castro was influenced by the Marxist writings of Karl Marx, Friedrich Engels, and Vladimir Lenin. Growing up, he had thought Cuba’s problem was corruption induced by American interference. He now came to interpret Cuba's problems as an integral part of capitalist society, or the "dictatorship of the bourgeoisie", rather than the failings of corrupt politicians. True to the Marxist philosophy, Castro now waited for the conditions that could make a proletariat revolution possible. Castro, popular among the poor voters, was set to win the June 1952 elections to the House of Representatives. He was to become part of the same system he hated. He would then have to change the system as an insider. However, the revolutionary in him got the perfect fuel for action even before the elections. In March 1952, General Fulgencio Batista, the former president who had returned to politics with the Unitary Action Party, seized power in a military coup. Declaring himself president, Batista moved to the right, solidifying ties with both the wealthy elite and the United States, severing diplomatic relations with the Soviet Union, suppressing trade unions and persecuting Cuban socialist groups. The only way this one-man dictatorship could be removed was through one fearless man who would not let anyone ruin his vision for Cuba. Castro first tried the legal route, filing numerous cases against Batista, but to no result. There was only one alternative left. The revolution was coming to Cuba. When did Castro turn rebel? On July 26, 1953, Fidel Castro, hoping to incite a rebellion led an attack on the Moncada Barracks, a military garrison outside Santiago de Cuba with just 129 men and 2 women. He filled his small, ill-equipped and poorly trained group of revolutionaries with fire. And revolutions need fire more than they need bullets. In a few hours you will be victorious or defeated, but regardless of the outcome – listen well, friends – this Movement will triumph. If you win tomorrow, the aspirations of Martí (Cuban national hero) will be fulfilled sooner. If we fail, our action will nevertheless set an example for the Cuban people, and from the people will arise fresh new men willing to die for Cuba. They will pick up our banner and move forward... The people will back us in Oriente and in the whole island. As in '68 and '92, here in Oriente we will give the first cry of Liberty or Death! This attack failed, and miserably so. Though the army lost 19 soldiers, the attack was a disaster. 6 rebels were killed and 22 others were executed without trial soon after capture. 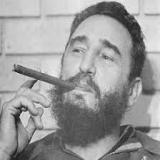 Castro escaped to the rugged Sierra Maestra Mountains with 19 comrades. Batista declared a martial law and spread misinformation that the ‘communists’ had killed hospital patients (they only took refuge in the hospital before capture). The General also declared that the army will kill 10 communists for each soldier he lost. He even published photographs of the mutilated bodies of many youth executed by the army. The Cubans were brimming with sympathy for the man who had dared to oppose the brutal dictator. Castro was captured soon, and he was glorious in his legal defence. Acting as his own counsel, Castro cited José Martí as the intellectual author of the attack and convinced the 3 judges to overrule the army's decision to keep all defendants handcuffed in court, also arguing that they had risen up against Batista (and not Cuba), who had seized power in an unconstitutional manner. The trial of Castro and his comrades was an embarrassment for the army, whose falsehood was exposed by Castro till the army decided to keep him away from the trials. The trial ended with the acquittal of most defendants; 55 were sentenced to prison terms of between 7 months and 13 years. Castro was sentenced to 15 years in prison. 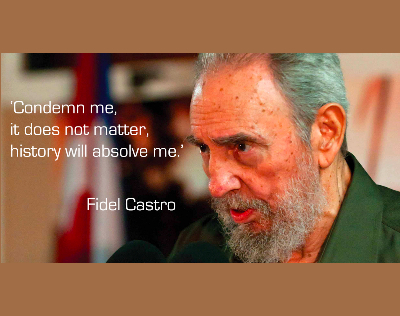 Right after knowing his sentence, Castro delivered a four-hour speech that would be printed under the title of nHistory Will Absolve Me.n The words "history will absolve me" are the concluding lines of his statement to the court. The published version called for a violent overthrow of the Batista government, democratic elections and removal of socio-economic inequalities. Castro continued his political activities from his prison premises under the banner of the "26th of July Movement" (MR-26-7) in memory of the Moncada attack's date. Very soon, he was locked in solitary confinement. Castro then suffered a personal setback. Castro discovered through a radio announcement that his wife Mirta gained employment in the Ministry of the Interior. He took it as an unbearable insult. “I would rather die a thousand times than suffer impotently from such an insult". Both Fidel and Mirta initiated divorce proceedings, with Mirta taking custody of their son Fidelito. Castro’s son would grow in the very bourgeois environment that Castro hated. Note: José Julián Martí Pérez (1853 – 1895) was a Cuban national hero and an important figure in Latin American literature. In his short life, he was a poet, an essayist, a journalist, a revolutionary philosopher, a translator, a professor and a publisher. Through his writings and political activity, he became a symbol for Cuba's bid for independence against Spain in the 19th century, and is referred to as the "Apostle of Cuban Independence." He also wrote about the threat of Spanish and US expansionism into Cuba. Where did Castro’s victory come from? Batista made a gross miscalculation and he was supported by the United States in doing so. In order to show to the world that he was democratic, he decided to release Fidel Castro, who he no longer considered a threat. 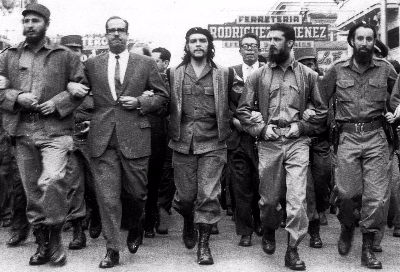 On May 15, 1955, Castro and his comrades were released. From now on, the government would closely monitor him, curtailing his activities. Castro now started controlling the proceedings of the MR-26-7 movement tightly. When some dissenters labelled him a caudillo (dictator); he argued that a successful revolution required a strong leader. In 1955, Castro, his brothers, and several comrades fled from Cuba to Mexico, where Raúl Castro befriended an Argentine doctor and Marxist-Leninist named Ernesto "Che" Guevara. Fidel Castro liked Che, later describing him as "a more advanced revolutionary than I was". This bond would stay strong till the very end of Che, who was a revolutionary as glorious and as fearless as Castro himself. 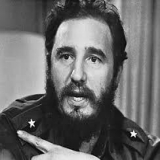 Castro was trained in guerrilla warfare by Alberto Bayo. 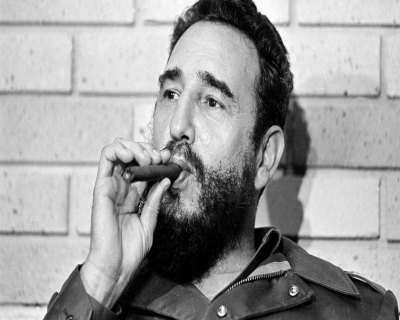 Castro managed to raise some funds from his sympathisers in the US, where Batista made an attempt to assassinate him. Castro kept in contact with the MR-26-7 in Cuba, where they had gained a large support base in Oriente. Other militant anti-Batista groups had also sprung up, primarily from the student movement. On November 25, 1956, in a decrepit yacht called Granma, Castro set sail towards his country with 81 armed revolutionaries and 3,000 oranges. At the end of a tiring journey, Castro’s men were assaulted by Batista’s forces, and within two days, he was left with just 19 men. 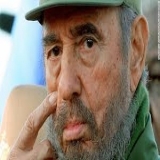 Despite facing death and defeat, Castro whispered in the ear of his comrade, "We are winning. Victory will be ours." Castro’s courage bordered on the insane. Soon he gained support of the locals who joined him to take the number to 200. The surviving rebels headed for an eastern mountain range, the Sierra Maestra, and waged a guerilla war against Batista's US-supplied army of more than 10,000 soldiers. Fed up of Fidel, on May 20, 1958, Batista launched Operation FF - Fin de Fidel or End of Fidel. It was a 76-day campaign to kill the guerrilla leader. In June 1958, US-supplied aircraft bombed the Cuban rebels who were hiding in a secret mountain command post called La Plata. Castro wrote to his then-confidant, Celia Sanchez: "I have sworn that the Americans will pay very dearly for what they are doing. When this war has ended, a much bigger and greater war will start for me, a war I shall launch against them. I realise that this will be my true destiny." Long story short: Batista's forces never found La Plata. The revolutionaries prevailed, Batista fled Cuba and Castro declared victory on January 1, 1959. He took immediate steps to prevent widespread looting. 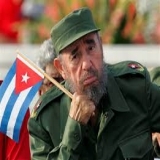 In response to popular uproar, which demanded that those responsible for the death of 20,000 Cubans during Batista’s regime be brought to justice, Castro helped set up many trials, resulting in hundreds of executions. Although widely popular domestically, critics – in particular the American press – argued that many were not fair trials. 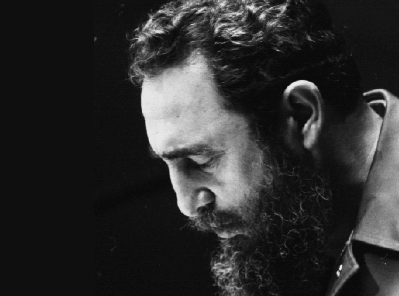 Castro responded that "revolutionary justice is not based on legal precepts, but on moral conviction." Who were impacted by Castro’s rule? Anti-Americanism: By 1960, Castro's government had seized private land, nationalized hundreds of private companies — including several local subsidiaries of U.S. corporations — and taxed American products so heavily that U.S. exports were halved in just two years. The Eisenhower administration responded by imposing trade restrictions on everything except food and medical supplies. Decrying "Yankee imperialism," Castro expanded trade with the Soviet Union instead. The U.S. responded by cutting all diplomatic ties, which would be restored only in 2014 at the initiative of Barrack Obama. Socialism in Cuba: With the support of the Soviet Union, Cuba managed to overcome the isolation and sanctions imposed on it by successive US administrations. The country was a part of COMECON, the economic community of erstwhile socialist states that traded with each other in a form of barter that allowed the weakest among them to overcome their own inadequate reserves of hard currency. What the Cuban system denied its people by way of ‘market opportunities’ was made up in ample measure by public investments in education and health. The Cuban healthcare system is the envy of most of the world; it has an innovative pharmaceutical industry and infant mortality and maternal mortality rates that are comparable to those in the first world. Like other socialist states, the political system was not plural; unlike them, however, the popular base of Castroism remained intact. Despite the best efforts of Cuban exiles and the United States, the Cuban system has survived. Cuba as an international power: Fidel was an internationalist and a revolutionary who recognised the importance of solidarity with people fighting for their rights against oppressive regimes and with peoples and states defending their national sovereignty in the face of pressure from the big powers and foreign capital. If the initial phase of Cuban internationalism took the form of Guevarism – supporting disparate insurgent movements in different Latin American countries – the Cuban state assumed a more formal internationalist role when Fidel Castro decided to deploy Cuban troops alongside the guerrillas fighting for the liberation of Angola in the 1970s. Latin American Integration: An important aspect of Fidel’s revolutionary leadership was his vision of Latin American integration. This he envisaged to happen through the strengthening of revolutionary or patriotic trends within individual nations in the region and through the creation of pan-continental initiatives that would allow states in the region to work together in the field of the economy, culture and media. Political transition: The collapse of the Soviet Union in the late 1980s presented Fidel Castro with a great political and economic challenge because of Cuba’s heavy dependence on the eastern bloc. The 1990s was a difficult period for the Cuban economy as foreign exchange dried up and imports, including fuel, were slashed. Gradually, however, the situation improved, helped in part by favourable political shifts in the Latin American region. Though President Obama is lauded for restoring contacts with Cuba, the restoration was a victory for Fidel Castro, who refused to bow down to American pressures in spite of heavy odds against him. Cuba is not an economic miracle. However, we will never know how well Castro could have managed the economy if the United States, sore loser that it was, had not imposed crippling sanctions on its tiny neighbour. Unlike other revolutionary leaders, Fidel had the wisdom and foresight to step down from power and supervise an orderly succession within his lifetime. At the first signs of ailing health, Fidel stepped down as president. His brother, and fellow revolutionary from the earliest days, Raul Castro took charge, first temporarily in 2006 and then formally in 2008. How does Castro’s legacy shape up? Castro's reign over the island-nation 90 miles from Florida was marked by the US-backed Bay of Pigs invasion in 1961 and the Cuban Missile Crisis a year later that brought the world to the brink of nuclear war. The Bay of Pigs Invasion was a failed military invasion of Cuba undertaken by the CIA-sponsored paramilitary group Brigade 2506 on 17 April 1961. The failed invasion helped to strengthen the position of Castro's leadership, making him a national hero, and bringing Cuba closer to the Soviet Union. During the Cuban Missile Crisis, leaders of the U.S. and the Soviet Union engaged in a tense, 13-day political and military standoff in October 1962 over the installation of nuclear-armed Soviet missiles on Cuba, just 90 miles from U.S. shores. In a TV address on October 22, 1962, President John Kennedy notified Americans about the presence of the missiles, explained his decision to enact a naval blockade around Cuba and made it clear the U.S. was prepared to use military force if necessary to neutralize this perceived threat to national security. It was feared that the world was on the brink of nuclear war. However, disaster was avoided when the U.S. agreed to Soviet leader Nikita Khrushchev’s offer to remove the Cuban missiles in exchange for the U.S. promising not to invade Cuba. Kennedy also secretly agreed to remove U.S. missiles from Turkey. The US government spent more than $1bn trying to kill, undermine or otherwise force Castro from power, but he endured unscathed before old age and disease finally took him. His supporters in Cuba - and there are millions of them - weep for his demise and rejoice in his life, as Castro is seen as a tireless defender of the poor. Critics say Castro drove the country into economic ruin, denied basic freedoms to 11 million Cubans at home and forced more than a million others into exile. Fidel Castro was a born revolutionary; he triggered a revolution when a revolution was needed; he truly espoused the spirit of communism though he was not untouched by elements of dictatorship; but most importantly, Fidel Castro remained true to his words and his principles. Castro refused to meet Barrack Obama when he made a ‘historic’ visit to Cuba with much fanfare in March this year. Fidel Castro is no more. His revolution is fading too. The Americans are back to Cuba. We may not know if his college friends achieved their life’s ambitions - becoming doctors and engineers and the like. What we know for sure is that Fidel Castro achieved what he had wanted as a young man. Glory.